The majority of the American people believe — due to a corporate mass media-induced blinkered naivety — that they are governed by their elected representatives in Congress which in reality is more akin to a Knesset serving the interests of war criminal Israeli Zionists rather than the interests of the God, peace, and gun-loving American people. While it is sometimes alleged that the the National Rifle Association, or NRA — supported by smaller groups such as the Jews for Preservation of Firearms Ownership — is the most powerful lobbying group in the U.S., it is nowhere near as influential as the American Israel Public Affairs Committee (AIPAC) whose leverage extends over far more areas of U.S. government policy. AIPAC’s headquarters is located several blocks from Capitol Hill in a nondescript but secure and heavily guarded building whose occupants work closely with the office in Jerusalem and oversee the activities of a further seven U.S. regional AIPAC offices. By working closely with their Washington Headquarters, each regional office maintains a year-round hands-on involvement for its members who are kept informed with seminars on Israeli issues and encouraged to become effectively involved on Israel’s behalf in both local and national politics. When a real and final catastrophe should befall in Palestine the first responsible for it would be the British and the second responsible for it the terrorist organisations build up from our own ranks. Though U.S. Jews subsequently responded with unprecedented generosity, by 1950, however, it became apparent to U.S. Jewish leaders that much more financial aid was required and accordingly they devised a four-point strategy to increase donations from Jewish individuals; encourage U.S. corporate investment in Israel; promote the sale of Israeli bonds; and request that Israel becomes a recipient of assistance from the U.S. aid program for underdeveloped countries. Despite such efforts, the demand of Israel’s economic and military requirements could not be met by handouts alone. Consequently in 1951 the American Zionist Council (AZC) was established to promote a pro-Israel lobbying campaign that would concentrate on influencing Congress. Having, however, been established as a tax-exempt entity, the AZC was not legally permitted to Lobby in the U.S. on Israel’s behalf and as a result in 1954 faced a possible investigation for its violations. To avoid such a possibility, the AZC rebranded itself as the non-tax-exempt American Zionist Committee for Public Affairs. Having subsequently over a period of time recognised that its Zionist objectives may be too harsh for the American Jews whose support it required, the Committee shrewdly once again rebranded itself by substituting the word “Israel” for “Zionist” to become the American Israel Public Affairs Committee. In 1961 Zionism/AIPAC suffered a setback with the inauguration of President John F. Kennedy (JFK) — who being determined to prevent a nuclear arms race in the Middle East — was consequently at loggerheads with Israel’s Ben-Gurion who earnestly believed that possession of nuclear weapons was essential for Israel’s survival. On realising that JFK would not budge on the issue, Israel joined forces with Communist China which was also desirous of nuclear weapons. Both countries then began secretly developing nuclear capabilities through intermediary “and richest Jew in the world” Shaul Eisenberg who was a close friend of duplicitous Henry Kissinger; a partner of Mossad gun-runner Tibor Rosenbaum; and pivotal in the assassination of JFK. In his book Seeds of Fire: China and the Story Behind the Attack on America (Dandelion Books, 2001), Gordon Thomas exposes how Mossad and CSIS (Chinese secret service) conspired on many occasions to not only steal American military secrets, but to also to doctor U.S. intelligence programs. The probability of Mossad’s involvement in JFK’s assassination was in 1994 clearly substantiated by Michael Collins Piper who in his incisive book, Final Judgment: The Missing link in the JFK Assassination Conspiracy, asserted that Israel’s motive for the assassination was JFK’s opposition which outraged Ben-Gurion who commanded the Mossad to become involved. JFK’s subsequent assassination served the dual purpose of eliminating the threat to Israel’s nuclear ambitions and the need for the main Zionist lobbying group to register as a foreign agent. “Israel’s Mossad was a primary (and critical) behind the scenes player in the conspiracy that ended the life of JFK. Through its own vast resources and through its international contacts in the intelligence community and in organised crime, Israel had the means, it had the opportunity, and it had the motive to play a major frontline role in the crime of the century – and it did.” Michael Collins Piper. “It is interesting — but not surprising — to note that in all the words written and uttered about the Kennedy assassination, Israel’s intelligence agency, the Mossad, has never been mentioned. And yet a Mossad motive is obvious. On this question, as on almost all others, American reporters and commentators cannot bring themselves cast Israel in an unfavourable light — despite the obvious fact that Mossad complicity is as plausible as any of the other theories.”- Former Rep. Paul Findley (R-Ill.), in the Washington Report on Middle East Affairs, March 1992. “You cannot criticise Israel in this country (USA) and survive.”- Helen Thomas (1920-2013), American author, news service reporter, opinion columnist, and member of the White House press corps. Today, approximately one-third of AIPAC’s Washington staff are administrative/clerical with the remainder being specialists in areas of strategic importance including communications and leading- edge weapons technology. AIPAC is structured to effectively maximise efforts by concentrating on the Executive Branch, Legislation, Research, and political development. Influencing the Executive Branch that is not elected but appointed and accountable only to the President is of vital importance when dealing with issues — such as the ongoing charade of the Middle East peace process — that are initiated in the Oval Office rather than by the bicameral Congress. By ensuring the presence of Jews within the ranks of the Executive Branch, AIPAC, rather than having to react to U.S. Middle East policy decisions, is instead in a position to exert influence during their formulation. 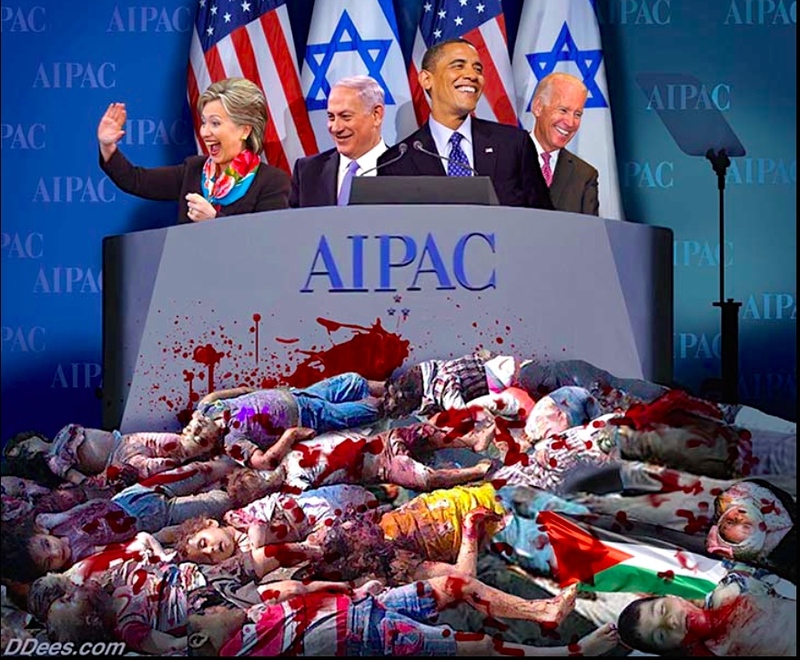 In the bicameral Congress AIPAC maintains an allegiance to Israel — that far surpasses loyalty to the U.S. itself — by requiring from every candidate a “signed pledge” to support Israel which if refused results in a cutoff from AIPAC’s financial support and a campaign of demonisation. Candidates who comply (sellout the U.S.) will then join the AIPAC gravy train with constituency rewards and free junkets to Israel. AIPAC’s organisational skills through its regional offices also ensures that while the U.S. core Jewish population is only 6.7 million (2.11 percent of U.S. population) Jews nonetheless have the highest ethnic group percentage of actual voters with an estimate of around 90 percent with 89 percent of them living in the twelve key electoral college states. Furthermore, despite comprising of only 1.8 percent of the college age population in the U.S., Jews — to their credit — total an astonishing 25 percent of Harvard and Ivy League college enrolment which will subsequently see them holding key positions that affect the state of the American nation. If you walk down any street anywhere in the U.S. and randomly question passersby about AIPAC, you will find that most, if not all, have never heard of it. Only 57.1 percent and 56.8 percent of eligible American voters cast their votes in the 2008 Presidential and Federal elections respectively. Hardly impressive turnouts for a nation which with pretentious chest-thumping arrogance insinuates itself as the hallmark for world democracy. 1. Deir Yassin massacre where 107 men, women, and children were either shot dead or killed by hand grenades being lobbed into their homes. 2. See also Einstein’s December 1948 letter to the New York Times which was also signed by many other prominent Jews. William Hanna is a freelancer with a recently published book the Hiramic Brotherhood of the Third Temple.